All over the world, countries are working toward reducing CO2 emissions. The need for this was highlighted by the recent release of the National Climate Assessment. One way to reduce CO2 emissions is by shifting to renewable energy. Most countries are already increasing the quantity of renewable energy powering homes and businesses, but it may not be fast enough. 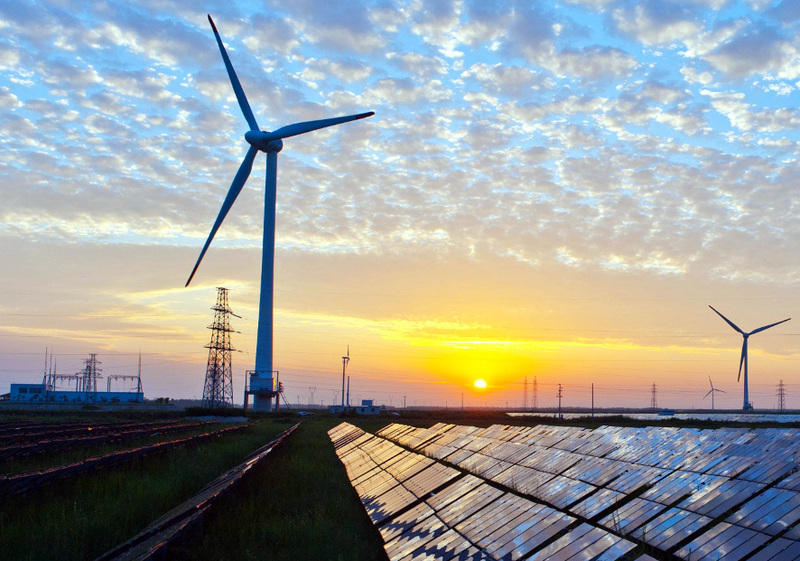 An ambitious target would be to generate 100% of electricity from renewable sources by 2050. A recent report for the European Union (EU) evaluates whether it is possible for Europe to achieve that goal. There are several types of renewable electricity. Many people are familiar with wind as they have seen large wind turbines on a cross country drive. Hydropower, generated by rivers at sites like the Hoover Dam, is another renewable resource. Solar panels are also fairly visible, on rooftops or in a field. We can also generate electricity through concentrating solar thermal power, which uses lots of mirrors instead of slim black panels and is more stable across the day, since there isn’t a sharp drop in energy when a cloud passes overhead. There is also geothermal power, which uses the heat from inside the earth and faces challenges a little deeper: it can only be used in certain locations, sometimes near volcanoes or hot springs. Bioelectricity, which operates similar to coal-fired power plants but burns renewable resources like grasses or other crops, is another way to generate renewable electricity that can easy meet demand. There are several determining factors if a region (whether that is a state, country, or group of countries) can be powered by 100% renewable energy. The region would need enough resources available to meet this need, and they will need to build enough power-generating operations to meet the need at all times. If (and when) wind slows, or the clouds block sunlight, there still must be enough electricity to go around, other options must be available. Many scientists study whether it is possible to get all of our electricity from renewable sources. We can build lots of renewable generation operation, but we still need to be able to to run them! We are also used to turning on the lights (or plugging in a phone when it’s at 2%) and having an immediate response, so we need to make sure this is still possible. This study ran a model first looking at what to build, then looking at whether the power plants they modeled will allow everyone to use the electricity they need in every hour. A biomass crop called sorghum. Source: Wikimedia Commons. The study found that biomass would be required to get to 100% renewable energy. Biomass can be controversial, because it still involves burning, which can create soot and smog. The burning process (called combustion) releases CO2, but that CO2 is absorbed by the plants when they are growing; the overall change in CO2 in the atmosphere is very small. When all renewable sources are allowed, the system can generate enough electricity for everyone. Another controversial technology, nuclear power, could also be used to cut CO2. Because it relies on uranium, it is not considered renewable, but it does not produce emissions. Nuclear power would allow Europe can meet demand for electricity while keeping CO2 emissions low, but certainly invites controversy. Unsurprisingly, switching to renewable energy will require building a lot of new electricity generation operations. More than half of the locations that could have wind farms or large solar arrays in Europe (places with open space that are windy or sunny) would need to build them. The model identified several paths to provide for future energy needs, each with different costs. A 100% renewable system would be more expensive than the current European system, but not so expensive that it would be unaffordable. Another important factor is whether the renewable energy facilities can be built quickly enough to meet the 2050 goal. Large amounts of wind power are added every year, and if this rate of increase is kept up, there would be enough wind built by 2050 for most of the scenarios this paper considered. It would be harder to increase the number of solar panels quickly enough for most of the 100% renewable scenarios. Although there is enough space to put these solar panels, the number installed each year would have to increase significantly to have enough in place by 2050. Other technologies would also need to be built very quickly. There is currently very little biomass, geothermal, or solar thermal. These technologies would need to be built at unprecedented levels. So while it is possible for Europe to generate all of its electricity from renewable sources by 2050, it would take a lot of work and commitment to achieve. The figure, taken from the research paper, shows one possible set of technologies to generate electricity in 2050. The pie charts show the share of electricity generation in each country, and the size of the pie chart is proportional to the total installed capacity. The circles inside each pie chart show the peak demand in that country (e.g. the maximum amount of electricity needed at one time). Source: Zappa et al 2019. Even if the EU does not quite meet the goal, they could significantly reduce emissions and still provide electricity to the country by working toward the goal of 100% renewable energy by 2050. Some states in the US are also setting goals to produce large percentages of electricity from renewable sources over the next few decades. As we increase how much of these technologies we use, there are many different benefits to society. We can have cleaner air, slow climate change, and have energy that is less threatened by fuel supply. Many renewable technologies can help protect consumers (people like you and me who buy energy) from spikes in price due to broken pipelines or international conflicts. Sorting out which technologies make the most sense in each region will help determine the best way to move forward while maintaining power needs.